At yesterday's Worldwide Developers Conference, Apple unveiled its next generation operating system, OS X Mavericks. While Mavericks incorporates a number of significant changes like a redesigned Finder, a Safari overhaul, and new Compressed Memory settings, there are also a number of other, smaller changes that MacRumors forum readers and other sources have unearthed. AppNap Settings - AppNap, which is designed to conserve battery by sending apps into a hibernation mode, can be disabled on a per app basis by developers. New Activity Monitor - The Activity Monitor has been redesigned, offering new charts and graphs that show bytes/packets sent/received. It also includes a new energy tab that shows the energy impact of apps and includes a built-in system diagnostics tool. Design Updates - Along with some app redesigns, Apple has removed much of the linen look that was introduced with Mountain Lion. Both Dashboard and the log-in screen have a new background. Launchpad folders also have a new translucent background, and Mavericks users will notice new fade in and fade out behaviors. Finally, Finder selections have new rounded corners and the dock has a new look. Notification Center - The standard gray linen background has been removed from Notification Center, in favor of a plain, dark background. Notification Center also includes a new Messages sharing option, allowing users to send messages without opening the app. It functions similarly to current Facebook and Twitter integration. 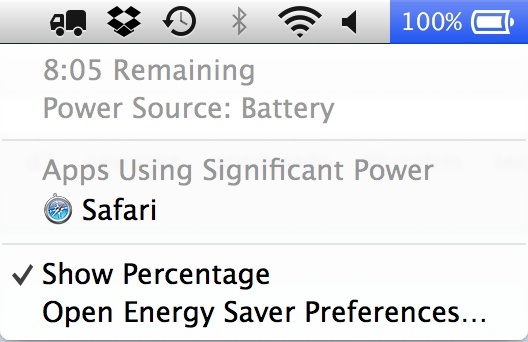 Battery Status - The Battery dropdown menu has received a new category in Mavericks, displaying apps that are using a significant amount of power. Offline Dictation - Mavericks introduces a new “Enhanced Dictation” feature that allows users to use dictation without an internet connection. 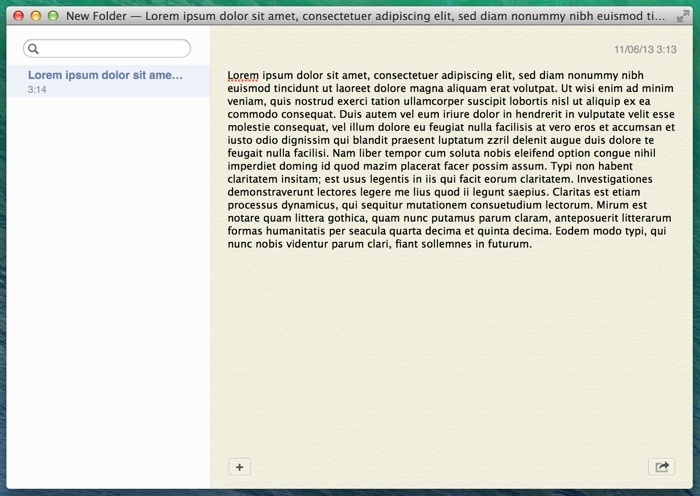 It also includes live feedback, which displays input before the enter key is pressed. The setting includes a 785MB download to enable the feature. Automatic App Updates - Automatic app updates are a new iOS 7 feature that has also been introduced to OS X with Mavericks. With this setting enabled, Mac App Store updates will be automatically installed in the background. LinkedIn Integration - OS X Mavericks includes native LinkedIn support. Do Not Disturb - While the Mac Notification Center already has a Do Not Disturb setting, Mavericks adds a new timer option that lets users schedule set times for the feature to be activated, similar to how the setting functions in iOS. Open GL 4 - Apple has updated OpenGL support in Mavericks and the OS will be available with the Open GL 4.1 Core Profile for Macs that support the feature. Text Shortcuts - Text shortcuts that were previously only available on iOS have been added with Mavericks. For example, "omw" is replaced with "On my way!" as in iOS. Skeuomorphism - While the Notes and Calendar apps have been redesigned with a new interface that removes some of the previous skeuomorphic design elements, Messages, Reminders, and Game Center have not been updated with a new design. iCloud Folder - Finder has a new iCloud folder, which displays documents that are stored in the cloud. iBooks Store - On its website, Apple has begun referring to the iBookstore as the "iBooks Store", which may be indicative of an upcoming branding change. System Requirements - According to AppleInsider, Mavericks will run on most machines that are capable of running Mountain Lion, including some systems dating back to 2007. Notably, all MacBook Airs after late 2008 can run the software, as well as mid/late 2007 15-inch MacBook Pros, mid–2009 or later 13-inch Pros, and late 2007 or later 17-inch Pros. These are just a small fraction of the numerous changes that will likely be introduced with OS X Mavericks. Additional updates to the beta software will undoubtedly include even more new features, which are being noted in a thread on the MacRumors forums. Apple made OS X Mavericks available for developers yesterday. While there is no current expected public release date, the final version of OS X Mavericks is expected in the fall. Support for machines from 2007 is pretty impressive. You could sense in the keynote and even see it in Tims face.. Apple is definitely going full force and I couldnt help but smile for for most part..
Why is the OS name plural anyway? OS X releases have always had singular names... Tiger, Panther, Lion, Leopard, etc... now... Mavericks? OS X Maverick would have sounded nicer. Apple said the new naming scheme will be places that inspire them from California. Dock looks the same. iOS 7 isn't hideous. Got anything else? Why is the OS name plural anyway? OS X releases have always had singular names... Tiger, Panther, Lion, Leopard, etc... now... Mavericks? OS X Maverick would have sounded nicer. I suggest, with tongue firmly in cheek: Big Sur. There's a truck next to Dropbox. Has Apple finally given us a new version of Font/DA Mover? That truck is put there by an app, Transmit. It's a rather excellent (IMHO) FTP/SFTP client. "Hey look everyone, I didn't watch the keynote!" They should name it after waves. OS X Jaws. That would be cool. Best release so far in terms of performance, It's very speedy, noticeable improvement over Mountain Lion =).